Human Neural Stem Cells (HNSC) are self-renewing, generated throughout an adult's life via neurogenesis. These multipotent adult stem cells generate the main phenotype of the nervous system, differentiating into neurons, astrocytes, and oligodendrocytes. HNSC play important roles for development, learning and hippocampal plasticity. They are also used to study age-related declines in proliferation, as well as neurological diseases like stroke, multiple sclerosis, and Parkinson's disease. The cells respond to injury, and can be differentiated to replace lost or injured neurons. They migrate in a directed fashion to brain tumors and help replace dying neurons in injured adult brain tissue. Cell Applications HNSC are primary cells derived from the cortex region of human brain (single donor). They are cryopreserved at first passage. Our HNSC stain positive for β-tubulin III, GFAP and oligodendrocyte marker O4 when cultured in Human Neural Differentiation Medium for 10 days. Each lot is tested for its ability to form neurospheres in Human Neural Stem Cell Growth Medium. (Click to Enlarge) Human Neural Stem Cells (HNSC) and Derived Lineages. HNSC differentiate to 3 lineages with the aid of specialized media. HNSC stained for Nestin (green) and Sox2 (red) (A). 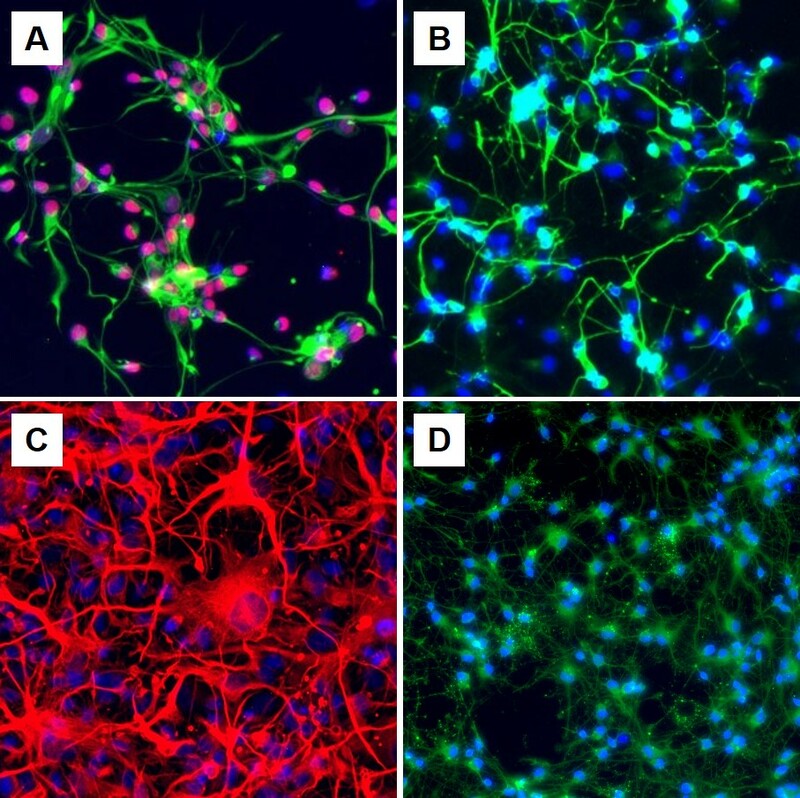 HNSC cultured in Medium 813D-100N differentiate to neurons (β III-Tubulin, green) (B), those in 813D-100A differentiate to astrocytes (GFAP, red) (C), and cells in Medium 813D-100O differentiate to oligodendrocytes (O4, green) (D). All cells are counterstained with nuclear-specific DAPI (blue).